This is an excerpt from the novel The Clockwork Rocket by Greg Egan, first published in the United Kingdom by Orion/Gollancz and in the United States of America by Night Shade Books. Copyright © Greg Egan, 2011. All rights reserved. “We have all those hues right here! Have you ever seen such glorious specimens?” Dario, who’d taken to resting limbless, budded a lone finger from the middle of his chest to gesture at the garden around them. Yalda, whose job it was to tend the flower bed, warmed with pride, though the blossoms he was praising were closed for the day, their luminescent petals furled and dormant. When the doctor had left, Yalda’s father, Vito, and her uncle, Giusto, talked the matter over with her grandfather. “Yalda should have planted more goldenrod!” Claudio blurted out accusingly. Giusto shushed him, but Claudia and Claudio exchanged knowing glances, as if they were the doctors now and they’d finally exposed the root of the problem. Yalda told herself that it was only an adult’s admonition that meant anything, but her older cousins’ smug delight in her supposed failure still stung. Vito’s tympanum became rigid with annoyance, but Yalda suspected that her grandfather was right. Her father was strong, but Dario had always been the heavier of the two and his illness hadn’t changed that. Yalda had never even glimpsed the forest, but she knew it was farther than the village, farther than anywhere she’d been. If there had been a chance of hitching a ride on a truck then someone would have raised the possibility, but the route must have been so rarely travelled as to make that an unlikely prospect. In the awkward silence that followed, Giusto’s rear gaze fell on Yalda. For a moment she thought he was merely acknowledging her presence with a friendly glance, but then she understood why she was suddenly worthy of attention in the midst of this serious, adult debate. The next day, the whole family woke before dawn to help the three travellers prepare. By the soft red light of the fields around them, Lucia and Lucio, Yalda’s brother and sister, darted back and forth from the store-holes, packing provisions for the journey into the generous pouches that their father had formed along his sides. Claudia and Claudio tended to Dario, helping him rise and eat breakfast, then taking him by the shoulders and walking him around the clearing to prepare his body for the long ride. Yalda’s other cousins, Aurelia and Aurelio, acted as stand-ins for Yalda’s passenger as Uncle Giusto coached her on her quadrupedal posture. “Make your front legs a bit longer,” he suggested. “Your grandfather will need somewhere to rest his head, so it would be good if your back sloped higher.” Yalda extruded more flesh into her two front limbs; for a moment her legs wobbled beneath her cousins’ weight, but she managed to stiffen them before she lost her balance. She waited until she felt the central shafts harden and the old joints ossify, then she cracked a new pair of knees higher up and reorganised the surrounding muscles. The last part was the most mysterious to her; all she was conscious of was a sense of pressure moving down her limbs and imposing order, as if her flesh were a bundle of reeds being passed through a comb to rid it of tangles. But her muscles weren’t merely straightening themselves out; they were making sense of their new surroundings and preparing for the new tasks that would be demanded of them. “Stop it, or I’ll throw you!” Yalda warned her. “Then I should be in front.” He grabbed Aurelia and tried to swap places with her. Yalda quashed her irritation at her squirming cousins and decided to treat it all as good practice: if she could keep her footing while these idiots sprouted arms just to wrestle with each other, she ought to be able to manage anything her ailing grandfather did. “You’re doing well, Yalda,” Giusto called to her encouragingly. “For a giant lump,” whispered Aurelia. “Don’t be cruel!” Aurelio said, pinching her on the neck. Yalda said nothing. Perhaps she was graceless compared to Aurelia, two years her senior – or even compared to her own brother and sister – but she was stronger than anyone else in the family, and the only one who could carry Dario into the forest. She trotted to the edge of the clearing, where the wheat-flowers were starting to close. She couldn’t see the sun itself yet, but brightness was spreading across the eastern sky. Dawn brought so many changes at once that Yalda had had to watch the flowers furling several times before she’d convinced herself that their petals really did grow dimmer, and weren’t just being outshone as they curled in on themselves for the day. “How do they know that they should stop making light?” she wondered. “They probably feel the heat,” Aurelio suggested. Yalda didn’t think the temperature had risen all that sharply. Yet the whole field had grown dim as they were speaking, the night’s glorious red blossoms reduced to pale grey sacs hanging limply from their stalks. She walked back towards Giusto, still pondering the question, remembering too late that she’d meant to race all the way to demonstrate her confidence in her new anatomy. Her father approached, on four legs too, Lucia and Lucio fussing at his pouches as they tried to even out the load. “I think we’re ready,” Vito said. “Scram, you two!” Aurelio leapt off Yalda’s back, rolling into a tight ball as he hit the ground; his co followed, shouting triumphantly as she landed on top of him. Dario was still not walking unaided, and he was muttering to his helpers about everyone crawling back into the ground and declaring a day of rest. Yalda was untroubled by this; if he didn’t believe she could carry him safely he wouldn’t even have risen, let alone cooperated as much as he had. Claudia and Claudio brought him over to her, and she knelt down on her rear legs to enable him to climb onto her back. He hadn’t bothered with arms before, but now he extruded three pairs, his chubby torso growing visibly thinner as the six ropy limbs stretched out to encircle her. Yalda was fascinated by the texture of his skin; the bulk of it appeared as elastic as her own, but scattered across the smooth expanse were countless small patches that had grown hard and unyielding. The skin around them was wrinkled and puckered, unable to spread out evenly. “This is easy!” she proclaimed. She rose up and began promenading around her assembled family. Dario was heavier than the two of his grandchildren combined, but Yalda was untroubled by the load, and increasingly sure-footed in her new form. Giusto had chosen her shape well; as she peered down at Dario he lowered his head and rested it between her shoulders. Even if his grip loosened he could probably doze off without falling, but she would watch over him every step of the way. A strange, sweet thrill ran through Yalda’s body. She was not the useless lump any more, eating as much as any two children, clumsy as an infant half her age. If she could do this simple thing for her grandfather, she would finally have earned her place in the family. With the sun clearing the horizon and a cool breeze blowing from the east, Yalda followed her father down the narrow path that ran south between the fields. Though the wheat had lost its nocturnal splendour, the fat yellow seed cases near the tops of the stalks always attracted more interest from adults than the delicate hues of the crop’s floral light – and when they came across two of their neighbours, Massima and Massimo, out baiting vole burrows, the talk was of nothing else. Yalda stood patiently, motionless save for the quivering required to send alighting insects on their way, ignored by everyone as they voiced their hopes for the coming harvest. “That’s none of our business,” Vito replied. “A man should think of his children,” Dario replied. “A woman should think of them, too.” Dario noticed Yalda’s rear gaze on him. “You concentrate on the road!” he commanded, as if that were sufficient to render the conversation private. Yalda obeyed him, shifting her gaze to make him less self-conscious, then waited for the gossip to continue. The path ended at a junction. To the right, the road led straight to the village, but they took the opposite turn. Yalda had set out this way many times before – playing, exploring, visiting friends – but she had never gone far. When she went west, it didn’t take long to notice the changes: soon the crossroads were spaced closer together, other people were passing her, and she could hear trucks chugging between the fields even if she couldn’t see them. The welcoming bustle of the village reached out and made itself felt long before you actually arrived. Travelling east was different: the same quiet and solitude with which you began the journey promised to stretch on for ever. Had she been alone, the prospect of spending an entire day walking away from every familiar sign of life would have terrified her. As it was, she felt a desolate ache at the sight of the rising sun ahead of her, with the realisation that even when it set she would still be heading in the same direction. Yalda looked towards her father. He said nothing, but he met her gaze reassuringly, quelling her fears. She glanced down at Dario, but his eyes were closed; he’d drifted back to sleep already. They passed the morning trudging through farmland, surrounded by fields so similar that Yalda was driven to hunt for patterns in the pebbles by the roadside just to prove to herself that they really were making progress. The idea that they might have lost their way and circled back was fanciful – the road was straight, and they’d been following the sun – but spotting these private signposts made a welcome diversion. Around noon, Vito roused Dario. They turned off the road and sat in the straw at the edge of a stranger’s field. Yalda could hear nothing but the wind moving through the crop and the faint hum of insects. Vito produced three loaves and Yalda offered one to Dario, who remained on her back; for a moment he appeared to be preparing to make a new limb for the occasion, but then the tentative bud on his shoulder disappeared and he used an existing hand to take the food. “Have you ever been in the forest before?” Yalda asked him. As they set off down the road, Yalda kept her rear eyes on Dario to be sure that his grip didn’t falter. She could always wrap him in arms of her own, if necessary. But though he appeared a little drowsy from the meal his eyes remained open. “What’s an arborine?” Yalda asked. Vito interjected a hum of disapproval, but Yalda gazed at him pleadingly until it decayed into a reluctant murmur of acquiescence. How could she be too young to hear a story that her cousins had been told, when she was the one carrying its teller to the forest on her back, not them? “At the end of the seventh age,” Dario began, “the world was gripped by a terrible famine. The crops were withering in the ground, and food was so scarce that instead of four children, every family had just two. “Amata and Amato were two such children, and doubly precious to their father, Azelio, because of it. Whatever food he could scrounge went first to his children, and he would only eat when they swore that they were satisfied. “Azelio was a good man, but he paid a high price for it: one morning he woke to find that he’d gone blind. He had sacrificed his sight to feed his children, so how could he find food for them now? “When his daughter Amata saw what had happened, she told Azelio to rest. She said, ‘I will go with my co into the forest, and bring back enough seeds for all of us.’ The children were young and Azelio didn’t want to be parted from them, but he had no choice. “The forest wasn’t far away, but the plants closest to the edge had been stripped bare long ago. Amata and Amato kept going deeper, hunting for the food that no one else had reached. “After six days, they came to a place where no man or woman had been before. The branches of the trees were so close together that it was impossible to see the sun, and the flowers shone without rest, day and night. The wild mother of wheat still grew there, and Amata and Amato filled pouches with its seeds, eating enough to keep up their strength but determined to bring back sufficient food to restore their father’s sight. “Above them, in the trees, the arborine was watching. He had never seen creatures like this before, and it filled him with rage to see them come into his garden and steal his food. “Amata and Amato gathered all the seeds they could hope to carry, but they were weak from their journey so they decided to rest before setting back for the farm. They hollowed out spaces in the soil and lay down to sleep. “Like the flowers around him, the arborine never slept, so for a long time he didn’t understand the intruders’ condition. But when he finally realised that they were blind to the world, he crawled onto a branch above them and reached down to wrap his arms around Amata. “In his anger, though, he’d misjudged his strength; lifting her up wasn’t easy. Amata was halfway into the trees when she woke, and the arborine’s grip faltered. She fought him and broke free, falling to the ground. Dario hesitated. “It’s not too frightening for you?” he asked. “Amata was mad with grief,” Dario continued, “but there was nothing she could do. She ran through the forest, trying to imagine what she would tell her father. He had lost his sight to save their lives; this news would kill him. “Then Amata’s way was blocked by a fallen branch, and an idea came to her. She smashed two rocks together until she had a shard sharp enough to cut the wood. And she carved the branch into the shape of Amato. “Azelio was filled with sadness, but when he touched his son’s shoulders the boy still felt strong, so he tried to stay hopeful. “In the days that followed, they feasted on half the seed, and Azelio took Amata’s word that both his children were sated before he ate. Amata planted the rest of the seed in their fields, and it began to grow. With her strength restored, she managed to gather more food from the edge of the forest, and the two of them saw out the famine. “Azelio’s sight did not return, but he was reconciled to that. What he could not accept was Amato’s unbroken silence. “Of course there was no reply, and Amata didn’t know how she could keep hiding the truth from her father. Yalda couldn’t help herself now; her whole body shivered with anguish. It wasn’t Amata’s fault that her co had died. What was happening to her was so unfair. “One night in the forest,” Dario continued, “Amata looked up into the trees and saw the arborine darting from branch to branch. She had grown into a powerful woman, and the fearsome creature that had taken her co looked much more weak and vulnerable now. “Day and night she watched the arborine, studying its ways. The arborine watched her too, but when it saw that she was doing nothing to take revenge, it grew complacent. “After a while, Amata made a plan. She dug a nest in the ground, and filled it with four small, carved wooden figures. Then she hid beside the nest and waited. “When the arborine saw the nest and what it thought were Amata’s children, it couldn’t help itself: it reached down to grab one and take it up into the trees. But Amata had bound the figures to heavy rocks beneath the soil, and covered them with sticky resin. The arborine was trapped, pinned against a branch of the tree by its own two arms that stretched down to the ground. “Amata climbed up into the tree, and with the shard of stone she’d used to carve the wood she sliced the arborine’s arms off. As it tried to grow more limbs to fight her, she leapt on it, spread her mouth wide, and swallowed it whole, just as it had swallowed her co.
“When she jumped back to the ground, Amata felt sick, but she forced herself to keep the arborine inside her. She lay down and tried to sleep, but her body was racked by fevers and trembling. After a time, she lost control of her shape: flesh was flowing this way and that, with strange new limbs growing and retreating before her eyes. Amata was sure that the arborine was fighting her from within, so she found the shard again and prepared to cut off its head as soon as it showed itself. “Sure enough, a head budded from her chest, and its four eyes opened. Amata raised the shard and began to bring it down, but then a voice said, ‘Don’t you recognise me?’ The head was Amato’s; he had survived inside the arborine all this time, waiting to grow strong enough to fight his way out. “Amata calmed herself, gathered all her strength, and pushed the flesh of her co to one side of her body until nothing joined them but a narrow tube of skin, thinner than a finger. Then she brought down the shard and severed it, setting Amato free. “They walked out of the forest and back to the farm, where they told Azelio the truth of what had happened. He rejoiced at the sound of his son’s voice, and forgave his daughter for deceiving him. As Dario fell silent, Yalda struggled to compose herself. She couldn’t stop her passenger feeling the unsteadiness in her gait, but she still had a chance to appear impassive to her father, to show him that she could take this gut-wrenching tale in her stride. The story hadn’t left her fearful of their destination; she was prepared to be vigilant in the forest, but even if there were arborines still living there a creature that struggled to lift an ordinary girl would have no hope of abducting the giant lump. What unsettled her more was the question: What if Amato hadn’t been rescued? What if Amata had remained alone? In the story there’d been a magical way to fix everything, but Yalda couldn’t help wondering: how would Amata have lived her life if her co had been truly, irrevocably dead? Late in the afternoon they came across two young farmers, Bruna and Bruno, heading into the village. Though no one in the family had met them before, after chatting for a while Dario discovered that he’d known their grandfather’s brother. Yalda didn’t envy them their long trip; it was one thing to walk this far as an occasional adventure, but to fetch routine supplies it would soon become tedious. If there’d been a truck running the length of the road every few days, from the village to the forest and back, everyone’s life would have been simpler. But the trucks only came out here to collect the harvest. They stopped to eat again just before sunset. The wheat fields still stretched out around them as far as Yalda could see, but the road they’d been following since the start of their journey had begun to meander slightly, and its surface had grown uneven. It was enough to puncture the numbing sense of repetition that Yalda had felt when they’d first set out, but it was as hard as ever to believe that the fields would come to an end, and that they really were heading out into the wilderness. “It’s not too much farther,” Vito promised. “We could stop and sleep here, but that would cost us a night in the forest.” Yalda understood: the whole point was to give Dario the benefit of the wild plants’ light, so delaying their arrival until morning would be a terrible waste. When they took to the road again Dario soon dozed off. Once Yalda had convinced herself that he was holding onto her securely, she lifted her rear gaze to watch the stars come out. The trails of light that emerged were like multicoloured worms struggling across the deepening blackness – though they appeared to be struggling in vain, swept across the sky in a slow whirl but coming no closer to their destinations. “Because they’re moving in different directions,” Vito replied. “Then I don’t understood anything,” Yalda declared forlornly. Encouraged, Yalda searched the sky for more clues, but instead of receiving any revelatory insight she merely recalled another source of puzzlement. “The sun has no trail,” she complained. Yalda turned this over in her mind. 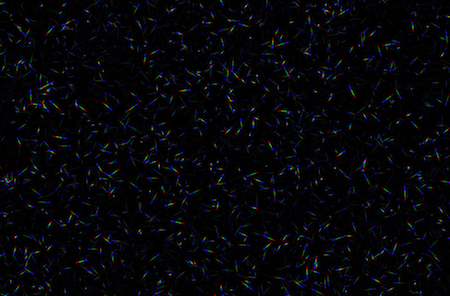 “If the stars are really moving,” she said, “then why don’t we see them move?” The coloured worms were all pinned to the rigid black sky, sharing, but never exceeding, the illusory motion that came from the world’s shifting gaze. Why didn’t they advance along their own trails, wriggling out of their constellations into fresh new patterns every night? The red light from the fields around them lit the way now. The familiar glow made Yalda sleepy, though the strength in her limbs was holding out well enough. If Dario could cling to her as he dozed, lost to the world but still disciplined enough not to slacken his grip, maybe she could close her own eyes and sleepwalk down the road. If only Vito had brought a rope to put around her shoulders and guide her steps, it might not have been a bad idea. When she saw the lavish jumble of colours ahead, Yalda wondered if she was fully awake. Vito’s body was partly blocking her view, and the strange apparition jittered around him, revealed and hidden in turn by the rhythm of their steps and the undulations of the road. The road came to an end. They walked across scrubland strewn with the kind of weeds and low bushes that Yalda spent most of her days uprooting. The plants’ tiny flowers shone up at her from around her feet, but the browns and yellows that, back on the farm, marked tiresome blemishes spoiling the wheat’s pure light struck her very differently now. She stepped around them gingerly, no more willing to crush them than she would have dared trample a neighbour’s crop. The nearest of the trees weren’t tall, and though it was hard to be sure in the unfamiliar setting Yalda thought she’d seen their like in uncultivated corners of the farm, or lining the streets of the village. They might have been sisters to the scrub plants; their muted colours were much the same. Behind them, though, exotic giants loomed, strewn with blossoms of every hue. Dario stirred and opened his eyes. Yalda expected him to mutter some complaint about the lengths to which they’d gone for the sake of quackery, but instead he gazed up at the lights in thoughtful silence. Perhaps he was lost in reverie, drawn back to memories of his youthful adventures with Daria. Yalda followed Vito into the forest. The undergrowth soon became too thick for her to avoid treading on the smaller plants, and she had no choice but to keep her soles as hard as she’d made them for the pebble-strewn road; if she’d softened her feet, as she did when she worked in the flower bed, the sharper stems would have lacerated her skin in no time. She kept her front gaze locked to the ground, measuring every step, but after a while she grew confident enough to lift her rear eyes from her passenger towards the festooned branches above. Flowers wider than her shoulders shone up into the darkness, their violet petals draped across a network of supporting vines; she could not see their light directly, but the glow seeping through each petal’s underside was bright enough to cast shadows. Around these monsters, smaller blooms in shades of orange, green and yellow crowded every branch and twig. When they passed through a swarm of mites, Dario shuddered and cursed; Yalda could shake off the insects herself with barely a thought, but her grandfather’s skin was not so fast to unseat them. He unwrapped two of his arms from around her torso and began to flail at the creatures, stretching the stubby fingers that had locked his hands together into broad fans better suited to sweeping the nuisance away. As they threaded their way between the trees, the violet behemoths overhead gave way to a kind of cousin, slightly smaller, with intense green flowers sprouting from the vines that had previously been bare. Some of these faced down into the undergrowth, dazzling the travellers; others were turned towards the sky. Yalda tried to picture how the forest would appear from high above the trees, a giant’s flower bed beside the staid red wheat fields. Vito stopped and looked around. They’d reached a small clearing where the flowers were as bright and varied as Doctor Livia could have wished, while the trees were not too closely spaced nor the undergrowth too tangled. If the forest held a better place to spend the night they could have searched until dawn before finding it. “They don’t frighten me,” she said. When Dario had climbed down, Yalda began resorbing the top halves of her long front legs. She was too tired to think carefully about her shape, but all it really took to regain her old posture was a forceful renunciation of the wariness she’d cultivated during the trip, when relaxing back to normality would have sent her grandfather sprawling onto the road. Vito emptied his pouches onto the ground and made himself bipedal too, then he and Yalda worked together to dig spaces for the three of them to sleep. The roots of the plants ran deep, and Yalda’s fingers had to bifurcate three or four times to slip into the soil alongside them and prise the whole mass loose; still, with her father helping the whole task was not too daunting. The worms whose homes she was wrecking were fatter and feistier than those she was used to, and after realising that they weren’t simply going to flee from her touch she started flinging them away across the clearing. Yalda didn’t correct him; whatever was going through his mind, he’d managed to make the compliment sound sincere. Vito shared a glance with her that she took to express amused concurrence with Dario’s sentiment, then he bid her goodnight. Yalda was exhausted, but she stood for a while beside her grandfather, gazing down at his sleeping form. Giusto had claimed that he’d seen Dario glowing yellow at night. If they wanted to judge the efficacy of Doctor Livia’s cure, shouldn’t they check for this symptom, both now and when they returned? Yalda had noticed that she cast a multitude of shadows, so she’d hoped to see how Dario appeared from within them – but alas, none was deep enough to reveal what light, if any, was emerging from his skin. Wherever she stood, she couldn’t shield him from every flower at once and observe the luminosity of his body alone. It was frustrating, but as she gave up and crawled into bed, Yalda thought of the bright side. If any light emerging from Dario’s skin was so faint that it was hidden by the forest’s glare, surely that meant that whatever hue he’d been losing back on the farm was now being replenished faster than it was leaking away. She wriggled deeper into the cool soil, squashing a few worms who’d escaped her earlier evictions, and gazed up into the violet backlight. She thought about the arborine – skulking along the branches somewhere, angrier than the worms – but if he came for her in the night she’d been forewarned. And if he snatched the men, smaller morsels that they were, she’d forgo Amata’s tortuous history of guilt and redemption and just cut them free first thing in the morning. To Yalda’s delight, the forest by day did show some fidelity to Dario’s story: many of the smaller flowers in the undergrowth, shielded from sunlight by the canopy of branches, really did retain their radiance. Most of the clearing, though, was not entirely sheltered from the sky. With the violet flowers curled up into crumpled sacs, sunlight spilled through the net of vines that had supported their outstretched petals, mottling the ground with brightness. After breakfast Yalda dug storage holes for the loaves they’d brought, and Vito used some of the groundflower petals in which they’d been wrapped as lining. Yalda didn’t trust the worms here to obey the usual rules, but her father assured her that the pungent scent of the petals would keep any vermin away. Once that job was finished, Yalda had nothing left to do but gaze into the forest. It was a strange situation; if she’d been moping around on the farm Vito would have quickly found her a task, and if there’d been no work at all her cousins and siblings would have dragged her into some game or other with their usual boisterous energy. At noon Vito brought out three more loaves. Dario remained half-buried as he ate, emitting unselfconscious chirps of pleasure. Yalda stood watching the slight movements of the branches around her, trying to unravel their causes. Over the course of the morning she had learnt to tell the difference between the swaying motion brought on by the wind, which was shared by many branches at once, and the trembling of a single branch when a small lizard ran along it. Sometimes she could even spot the successive rebounds when a lizard launched itself from one branch and landed on another. “What do lizards eat?” Yalda asked Vito. Yalda contemplated the second part of his reply. How could he not be sure? Were there things about the world that adults didn’t know? Dario offered no verdict on the lizards’ diet, and though he might just have been too preoccupied to bother, Yalda was beginning to wonder if she’d misunderstood something important. She’d thought that every adult’s role was to instruct their children and answer their questions, until the children knew all there was to know – by which time they were adults too. But if some answers weren’t passed down from generation to generation, where did they come from? Judging that it would be impolite to probe the extent of Dario’s knowledge in his hearing, Yalda waited until he had dozed off again. “Who taught you about the stars?” she asked Vito. “All those things you were telling me last night?” She had never heard Dario speak about the origin of the colour trails. Yalda knew there was a school in the village, but she’d always thought its purpose was to train people for unfamiliar jobs, not to answer their questions about the stars. “I wish I could have met her,” she said. “Show me! Please!” Yalda wasn’t sure what the point of writing was, but the prospect of seeing her own father perform the elaborate trick was irresistible. He stood for a while, silent and motionless. Then the skin of his chest began to tremble, as if he were shooing off insects, and Yalda noticed some strange, curved ridges starting to appear. They weren’t holding still, though; they were slipping away across his body. Yalda could see him struggling to keep them in place, but he wasn’t succeeding. Vito relaxed, smoothing out his skin. Then he tried again. This time, a single, short ridge formed near the centre of his chest, and though it quivered a bit it more or less stayed put. Then, as Yalda watched, it bent in on itself until it formed a crude circle. “Let’s see if I can do the next one.” Vito’s tympanum grew taut with concentration as the ridge spread out and re-formed, winding itself into five wide loops. “One more.” The flower split apart and the lines that had formed the petals softened. But then the fragments came together in a new configuration and the ridges grew sharp and clear again. “All right, three symbols, that’s enough!” Vito’s shoulders sagged. “Teach me how to do it!” Yalda pleaded. “There’s nothing else to do here,” Yalda pointed out. She would have happily gone exploring in the forest instead, chasing the lizards to find out what they ate, but they couldn’t leave Dario behind. “I suppose we could try one symbol,” Vito said reluctantly. He beckoned to her, and Yalda knelt down so she was closer to her father’s height. He sharpened a finger and began scratching gently on her chest, never moving from the same small spot. Soon his touch was as irritating as the attentions of any insect. Yalda squirmed; her skin was quivering, but that was giving her no respite. A mite would be swiftly unseated, but this prodding finger was far too heavy to dislodge. “I don’t see any shapes yet,” Yalda complained. It was harder than changing her posture, harder than reshaping her hands, harder than anything Yalda had tried to do with her body before. Most transformations took some effort, but once she pushed herself her instincts took over. This was different: the only thing her instincts wanted her to do was stop wasting her time with this ineffectual shuddering and simply sweep away the nuisance with her hands. But she persisted. Her mother had learnt to do this, taught by her friend, then passed on the skill to her father. Impossible or not, her mother’s finger was prodding her, urging her to keep on trying to tame the swarm of tiny muscles beneath her skin. By the time the clearing fell into gloom and the violet flowers above them unfurled across their nets, Yalda had made her own sun, written on her skin. As she peered down at her chest the dark circle writhed like a worm chewing its tail, then broke apart. Vito looked wearier from his efforts than she was. “Well done,” he said. “Can I show Dario?” He’d be amazed, Yalda thought. Not one day in school, and here she was writing! Yalda woke, confused for a moment by the brightness of the clearing. It wasn’t morning; she’d been roused from her sleep by the sound of Dario humming with distress. She turned to look towards him, then rose to her feet for a clearer view. At first she’d thought that a strong wind must have blown through the forest, tearing petals from the trees and strewing them over his body as he slept. But the patches of luminous yellow belonged to his skin. Yalda knelt by Dario’s bed; his eyes were closed but he was thrashing from side to side. She could feel mites coming and going all around him; she tried waving them away, but they were persistent. As Vito stirred, the haze of sleep cleared from Yalda’s vision and the throng of mites came into sharper focus. Those that were descending onto Dario’s body appeared perfectly ordinary, but those rising up into the forest again, having bitten him, were imbued with their own small share of the strange yellow light. Yalda had never seen anything like it; when an insect fed on a flower it did not take on its glow. She looked up to see Vito standing across the bed from her. “He’s in pain,” she said. “I think the insects are troubling him.” She widened her hands and fanned more vigorously, hoping that her father would join in. “The heat!” Dario protested miserably. “Is this what childbirth is like? Is this my punishment?” His eyes remained firmly closed. Yalda doubted that he knew where he was or who was tending to him. Vito said nothing, but he knelt and began swatting at the insects himself. Yalda peered down at Dario, hoping for a sign that their efforts were bringing him some respite from his suffering. A new patch of radiance had appeared, a shimmering yellow smudge that appeared to be leaking out from a tear in his skin. It was spreading at an alarming rate, as if it was made of some unimaginably soft resin. Yalda had never seen anything move so freely, other than the finest dust – but despite the steady breeze this wasn’t scattering like dust. “What is that?” she asked Vito. Vito spoke the last word with an air of dismay, but before Yalda could ask him what it meant the whole clearing lit up, brighter than day. She closed her eyes instinctively; when she opened them the light was gone, but everything looked darker, as if she’d been staring into the sun. “We have to leave,” Vito declared abruptly. Dario gave no indication that his son’s terrible verdict had reached him through the thicket of his pain and confusion. As Yalda rose to her feet, forcing herself to obey Vito even though she couldn’t bring herself to believe him, a speck of light hovering in the distance ahead of her erupted into painful, blinding brilliance. As she covered her front pair of eyes with her arm, she thought: That was a mite. The mites that had fed from Dario’s skin and stolen his light were burning up, and each tiny blaze was brighter than the sun. Vito leant down and whispered something to his father. Then he stood and led the way out of the clearing. Yalda stole a glance at Dario then tore herself away. She would not accept that his fate was sealed; she would not say goodbye. Yalda obeyed. A third burst of light came from the clearing – behind her now, but even the glare reflected from the branches ahead was dazzling. Dark traces lingered on her vision, a second ghostly forest imprinted on the first, complicating everything. “I don’t understand!” she said. “I thought the light here would make him better!” If she forced her father to remember Doctor Livia’s pronouncement, and tie what they were seeing to that, maybe he’d change his mind and turn back. Yalda pushed her way through the branches angrily, relying on touch more than sight; she was barely registering the ongoing flashes, but the after-images kept building up until she was no longer sure which looming obstacles were real. Even in the depths of his illness Dario had retained his gruff affection for her. How could she walk away from him? They emerged from the forest and headed back towards the road. Maybe the mites were actually helping, drawing the poison out of Dario’s body. Dying in his stead. If they stopped to rest, Yalda decided, she’d sneak back while Vito was asleep. If Dario had survived, healed by the self-immolating insects, she could carry him out to rejoin his son. The ground ahead of her brightened unbearably then a rush of air knocked her flat. She tried to call out, but her tympanum had seized up, leaving her both mute and deaf. She crawled across the weeds; they looked like dead husks, but she couldn’t tell if they’d really been transformed or whether it was her vision that had been stripped bare. She groped around, sure that Vito was close but afraid to lift her gaze to search for him. Then she felt him reach out to her and they held each other tightly. They stayed there, huddled together on the ground. Her father’s embrace was not enough to make her feel safe, but it was all there was. Yalda woke to a brightening sky and the sound of insects. Vito was awake, crouched beside her, but he remained silent as she stood to survey the aftermath. The forest was still standing but the closest part was visibly thinned and damaged, as if a giant had reached down and pummelled it. Some of the low bushes around them were dead. Yalda’s skin was tender as she moved. “He’s gone,” she said. Dario could not have survived at the centre of this destruction – let alone survived being the cause of it. “Is that a good thing?” Yalda had seen how much pain Dario had been in at the end, but she had nothing with which to compare it. “No.” Yalda felt her whole body shaking with an involuntary hum of grief. Vito held her until she was still again. Yalda looked back towards the ruined edge of the forest. Copyright © Greg Egan, 2011. All rights reserved.